Pour everything into a four or two quart slow cooker. Cook on low 8-10 hours. Remove the meat to a cutting board and shred it. Set aside. Mash the contents of the slow cooker until fairly smooth. Return the pork to the slow cooker. Toss to evenly distribute the sauce. Serve on rolls. No matter how many slow cooker recipes I create (and I have created a ton! I wrote a cookbook with 300 recipes for the slow cooker and this is my 119th on Coconut & Lime!!) I always seem to come back to pulled pork. While I love it made the old-fashioned way--smoked, preferably by people who are not me, in the South--it is one of the most consistently good things you can make in the slow cooker. The meat is always tender, it is always flavorful and it is nearly (or totally, I've never had it happen) impossible to overcook. Since I'm making it in the slow cooker anyway, I've used this as an excuse to do some odd things to pulled pork. I'm talking cooking it with apples, with leftover cranberry sauce, with pumpkin and jerk seasoning, fresh blueberries, and even tart rhubarb. So it was inevitable I guess that eventually, I'd get around to making it with acorn squash. I have a love-hate relationship with acorn squash. On one hand--yay local produce in the late fall! On the other--acorn squash is kind of boring. I guess it isn't its own fault, tomatoes and other summer vegetables are so much more attractive. Still, I sometimes struggle to include as often as I feel like I should. That's the beauty of this recipe. You get all of the benefits of squash (vitamins!) 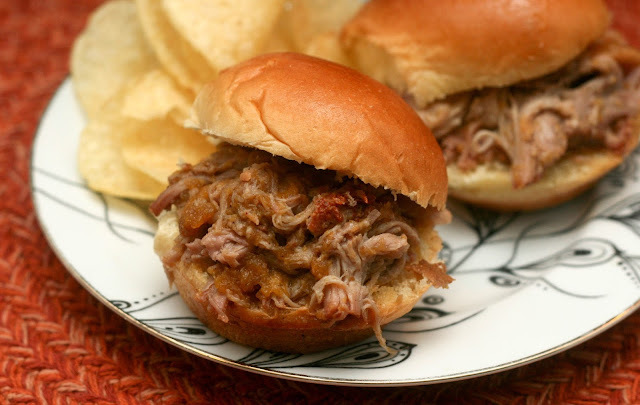 but while it adds some depth to the flavor of the pulled pork, it isn't the star of the show. It also creates a natural, thick sauce which is awesome and eliminates any need to make, buy or steal barbecue or chili sauce. Note: I made this with ingredients I bought at Aldi. If you'd like to see an "Aldi-fied" version that lists exactly which Aldi products I used, click here to view it on my new Aldi fan site.